Can the global mess be cleaned up? Plastic waste is clogging landfills, sullying cityscapes, fouling oceans with massive debris fields and killing sea creatures that ingest everything from discarded fishing equipment to disposable food containers. 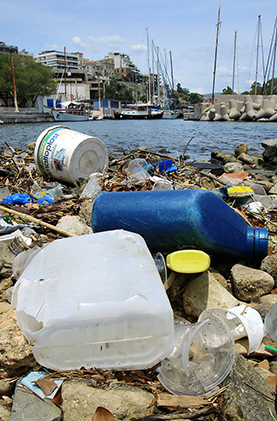 The problem has become so acute that plastic could outweigh ocean fish by 2050. The crisis threatens not only wildlife but also human health, as plastic breaks down into microscopic pieces that enter the global food chain. Environmentalists have long promoted recycling as a key strategy for curbing plastic pollution, and more recycling plants in the United States and Asia are planned. But China — once the world's leading recycler — announced last January that it would stop accepting plastic waste from other nations, creating uncertainty about where millions of tons of plastic detritus will go. As the threat grows, more municipalities are banning plastic shopping bags and drinking straws, and corporations are redesigning packaging to reduce waste. But conservationists say such steps will go only so far. The real solution, they say, is to stop producing so much plastic.